Many coral reef islands, or atolls, are created by water moving sand and gravel, piling it up into consecutive ridged layers, "a bit like onions," says Paul Kench, earth scientist and dean of science at Simon Fraser University, Burnaby, Canada. However, new research by Kench and colleagues recently published online ahead of print for Geology uncovered a different type of island construction: storm-deposited boulders. On Tutago island in Tuvalu's Funafuti atoll, giant coral blocks sit on top of a flat reef. Researchers noted the jumble of upended corals didn't grow there, but instead were tumbled onto the site. As storm waves hit the reefs, it's not just fist or head-sized gravel chunks that are moving—Kench says coral boulders, which can be meters in diameter, are getting plucked and hurled into piles, forming the island. To better understand how storms shaped Tutago, the team collected radiocarbon dates on the piled coral blocks. Within these boulder deposits, they uncovered distinct clusters of ages, revealing that Tutago island formed about 750 years ago, and at least two major storm events occurred about 600 and 350 years ago. Understanding how Tutago formed can be helpful to other researchers interested in atoll behavior, coral reef regeneration, and ancient storm events. "I think there's certainly purchase in this notion that the islands are archives of storm sequences," says Kench, adding that storm records in the remote ocean can be tough to find. Storm events have built Tutago up vertically, but that isn't always the case for islands. Kench says that understanding how an increase in storm frequency and intensity might modify atolls—especially whether they add or destroy land—is extremely important to island communities and governments. "It's quite real for some of these communities," he says. "They're dealing with environmental change on a daily basis." Kench, P., McLean, R.F., Owen, S.D., Tuck, M., and Ford, M.R., Storm-deposited coral blocks: A mechanism of island genesis, Tutaga island, Funafuti atoll, Tuvalu: Geology, https://doi.org/10.1130/G45045.1. Contact: Paul Kench, p.kench@auckland.ac.nz. 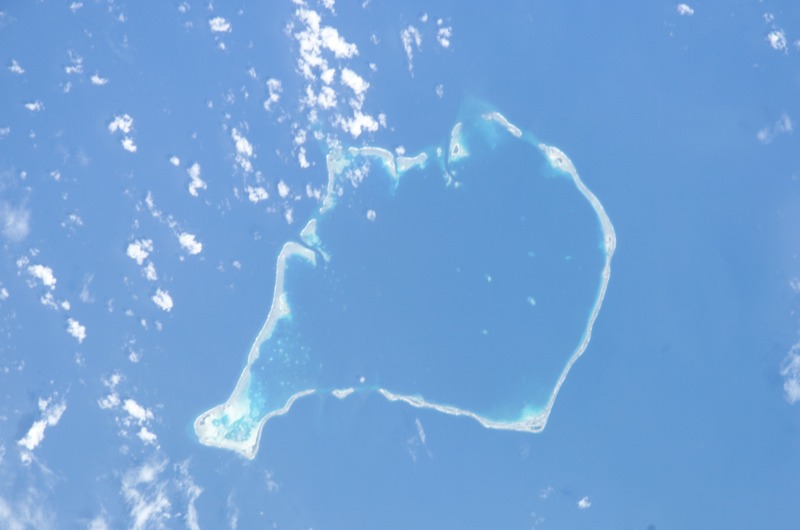 Tuvalu's Funafuti atoll. Image courtesty NASA.